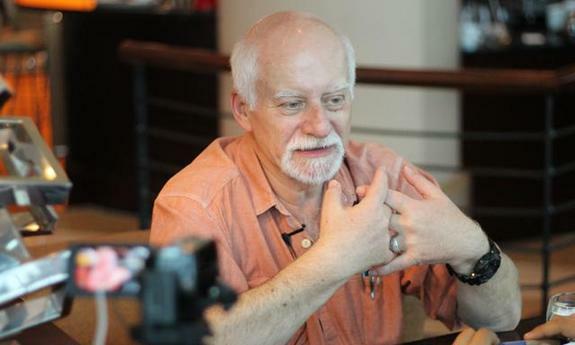 Today, we conclude our interview with writer Chris Claremont, who in this portion shared more of his own views on his landmark story God Loves, Man Kills as well as religious tolerance. FN: “Religiousness” is changing in our country and in the world in terms of how often people go to church on Sunday, how messages are communicated and so forth. 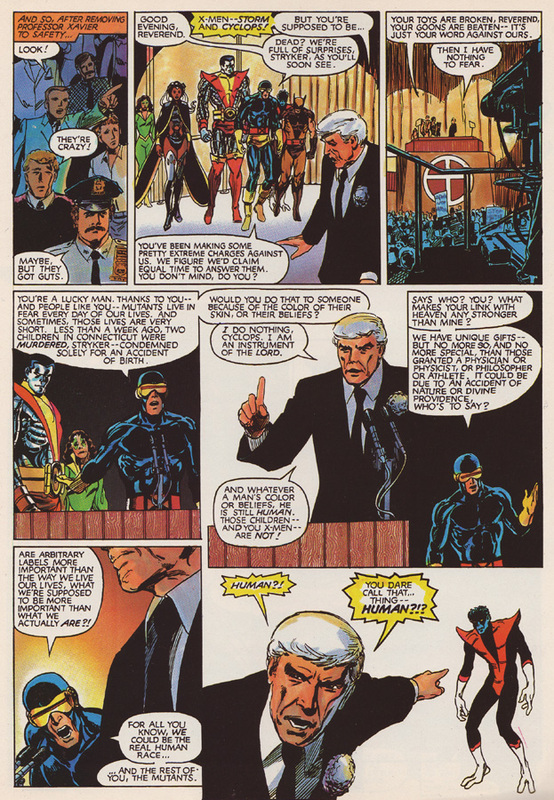 One might even say that messages that are found in X-Men and pop culture stories like it are more relevant now than ever. For me, as a priest, it’s one thing to just preach from the pulpit on Sunday about forgiveness, loving one’s enemies, etc, but it is extremely effective to take a story that’s a metaphor, using superheroes or Hunger Games or whatever it is, and convey the same messages. No one faith has a trademark on loving your enemies, so it’s not necessarily the Christian packaging of the message, even though I am a Christian, but it’s still tremendously effective to me when I hear the same values being, for lack of a better word, “preached” in your stories. It resonates for me as a fan, and as a pastor I find it to be tremendously effective with youth of not only my community here in San Francisco, but with people of all ages, especially since they’re so mainstream now. CC: The key to me has been, if I can find a way to present the conflicts and realities of these incredibly ridiculous characters in a manner that allows the reader not to look at them as costumed icons doing global damage like Superman did to General Zod in the last movie, but, as letters used to say, “I’ve been in a scene like that. I’ve been this character or that character.” If you can find a way within the context of the “skintight reality” to make a point that is valid in reader reality in a way that they’ll actually listen and pay attention, bravo. And when you encounter someone for whom that has actually happened, as cliché as it sounds, it makes everything worthwhile. You’ve established a real, visceral connection between the work, the creator, and the reader. That’s what it’s all about. Hopefully none of us are in this for the money, we are in this to reach out and exchange ideas. Me tossing the ideas out there and the audience tossing back their response. If I get it right, I keep going, and if I don’t, well, try again. A variant on that is, within the characters, I had a moment in New Mutants where Magma is talking to a character who might become her boyfriend, except that he plays for the other team, the Hellions, who are not nice guys. What it’s all about is, he’s Christian and she’s not. As she puts it, she’s met Hercules. She’s seen Olympus. She knows her gods are real. How do you square the equation? How do you address the question of faith, of belief, of understanding? For me, the frustration has always been the idea of “but.” I can understand this, but what then? In my head, I think if heaven exists, it’s an infinite space because it’s got to accommodate an infinite number of belief structures, all of which are valid, all of which lead to the same end, but by the most convoluted, different directions. Who are we to determine the rightness or wrongness of any single one? We’re always looking up from below, where the view is very limited. There has to be, to me anyway, a measure of generosity and of, in the truest sense of the word, justice, which carries with it an element of tolerance. If you can’t find a way to embrace that, or at least start from there… to throw yet one more cliché in the mix, all the good intentions in the world won’t divert you from the road to hell. The bedrock analysis, at least of my approach to the concept and the team and characters is, “We’re here and we’re doing this because we want to have a good life, just like everybody else.” Everyone will make mistakes along the way, but the idea is to treat those mistakes with a measure of understanding, and help the people responsible make sure that they don’t do it again. To learn, and hopefully get better. 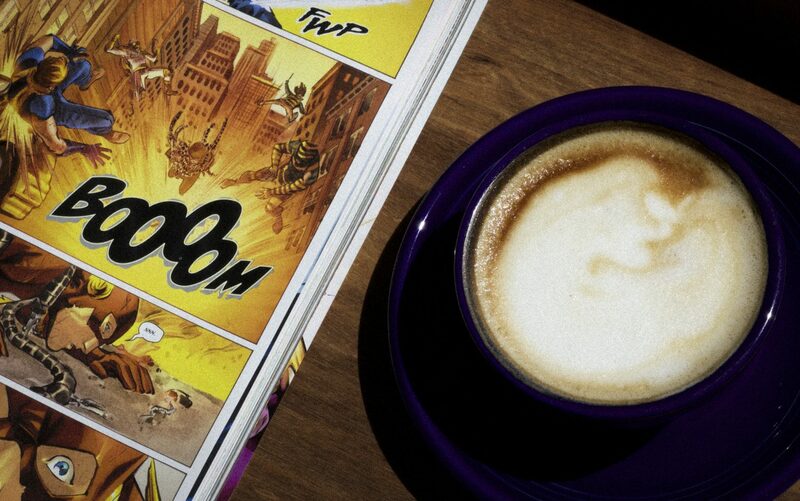 FN: With a blog titled, “Christ, Coffee, and Comics,” I wasn’t sure how controversial you thought this was going to be, and I hadn’t intended on bringing up direct religious concepts, at least in terms of different denominations, etc, but what you said was really interesting. You may not know this (I didn’t even know this about my Church until I went to seminary), but in the history of the Orthodox Church… and we are obviously human too, and not perfect… there have never been forced conversions, inquisitions, wars like the Hundred Years War in the West between the Catholics and Protestants, and no history of proselytism [in terms of sending missionaries to try to convert other Christians to Orthodox Christianity], if you believe it. For instance, in the Byzantine Empire and afterwards, Orthodox Christians did not send, let’s say, missionaries to Italy or France. They always believed… we always believed, and I think we still hold to this today, that the best way to reconcile any theological differences, at least with other Christian faiths and even Abrahamic faiths as well, is to dialogue, for our leaders to get together and talk. I’m not sure how much you follow the news about our Patriarch and the Pope who get together from time to time and really have been making a good faith effort (pun intended) over the last 75-100 years to reconcile the two Churches – Rome and Constantinople. Just going back to God Loves, Man Kills, even though I’m a clergyman, I don’t need to be sold on the idea of Stryker being a fundamentalist because the Church, maybe even more than a lot of other groups, knows the dangers of fundamentalism. Again, it’s all about tolerance, while at the same time proclaiming love and, in our view, the Gospel, but again, always being tolerant. CC: By the flip side of the coin, I’ve never been hauled up by Pat Robertson as a tool of evil. It may sound flip, but I take solace in a measure of ignorance in that I don’t know everything, therefore I feel I have no right to say my way is better. I have no idea. My way is my way. The key aspect of it is unfortunately, by the time someone finds the absolute truth, there doesn’t seem to be a way of calling back and saying, “Hi, guess what I found out,” which is the essence of faith. You have to take it as it comes, and make your own decision. I guess all I find myself saying is, everyone has the right to their own beliefs and their own sense of understanding and sense of purpose, but it should come with tolerance for the beliefs and the ethics of the people you are standing next to, and the people standing next to them. You may not agree, but everyone should try to find a way to understand and, pretentious as it may sound, tolerate. Not in a pejorative sense, but just in the sense that… we are all trying to find a way. Some people do it solo, some people do it in groups, some people do it in huge groups, but, to me anyway, I guess the idea with God Loves and the X-Men is to say with that faith should come an understanding that others may be walking a similar path but with different perceptions, specifics. A different vision of what the end goal might turn out to be, even if it turns out to be the same, as long as it does no harm to anyone else. No one is that smart or that insightful that they have the luxury of condemning. That’s the arrogance of youth and the arrogance of comics… to think you can come up with an answer, anyway. FN: I really could talk to you all day long about your career, and this has been wonderful. I almost popped in with a smart aleck remark when you were talking about being in awe in front of celebrities… I’m pretty proud of myself. I’ve contained myself pretty well during our conversation. FN: That’s the funny thing about comic book creators- none of them see themselves as celebrities! It blows my mind that these stories/characters are so mainstream and you’ve been putting them together all these years, and yet when you meet a person like Chris Claremont or anybody else, they all see themselves as regular guys, which is amazing. All your work is being put on the screen now and is all huge and great, and you especially, being my favorite writer, are a celebrity in my book, whatever that means. I just wanted to thank you again for your time, it’s been really, really wonderful. Maybe we’ll do a Part 2 sometime down the road, maybe next year. CC: Okay, no problem. Thank you for your kind words. Good thing this isn’t a videophone or you’d see me blushing like an idiot. 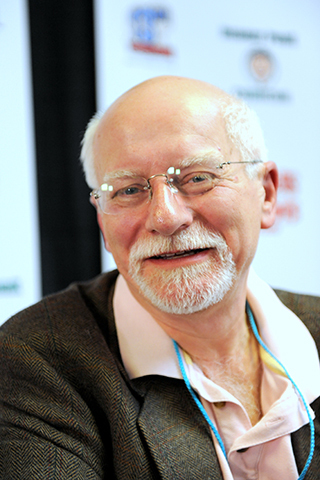 Many thanks again to Mr. Claremont for his time!